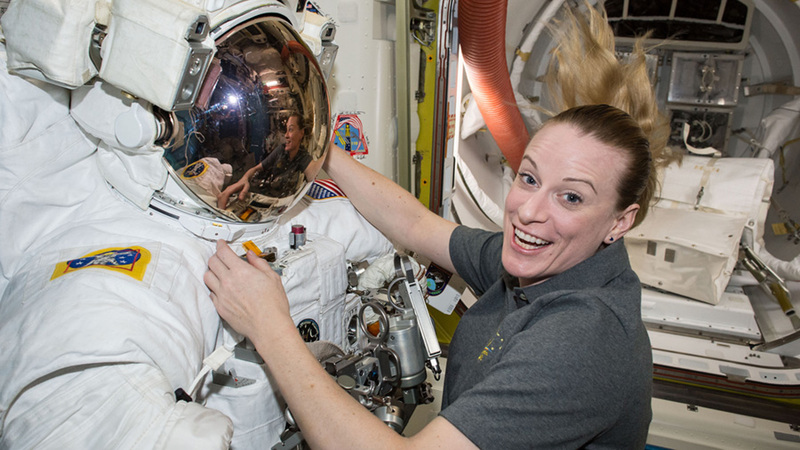 Astronaut Kate Rubins checks a U.S. spacesuit she will wear during a spacewalk planned for Aug. 19, 2016. Flight controllers and the Expedition 48 crew are preparing for tonight’s International Docking Adapter extraction work and Friday morning’s installation spacewalk. The orbital residents are also continuing to load the SpaceX Dragon with gear and science for return to Earth. Controllers on the ground checked the Canadian robotics systems they will use to remove the International Docking Adapter from the rear of the SpaceX Dragon tonight. The new adapter will be extracted with the Canadarm2 then maneuvered to a point about three feet away from its installation point. It will then be installed on the Pressurized Mating Adapter-2 which is attached to the forward end of the Harmony module. The final and intricate installation work will be done during a 6.5 hour spacewalk scheduled to begin Friday at 8:05 a.m. EDT with astronauts Jeff Williams and Kate Rubins . The new adapter, the first of two, will enable new Commercial Crew vehicles being developed by Boeing and SpaceX to dock at the International Space Station in the future. In the meantime, the SpaceX Dragon cargo craft is still being loaded with gear ahead of its return to Earth on Aug. 26. Rubins spent the morning packing Dragon with research samples and used hardware for analysis back on Earth. I was told many experiments have been done at ISS and I Would like to see a list of them. Including results or conclusions. Where can I find them?